If you follow this thread you get the idea about NAC guns. Of course at the time this thread was in flux, I didn't know that you would be the winner of the NAC and Nickel guns. I am happy to have NAC5 inspected for internal tool marks to prove it is a Colt receiver. I don't mind is being debated. I do have a 'real' Colt so I don't need NAC5 to be something it is not. Great detailed pics! Those 1921 A's with early features are cool. How bad are those splotches on the left side of the reciever? 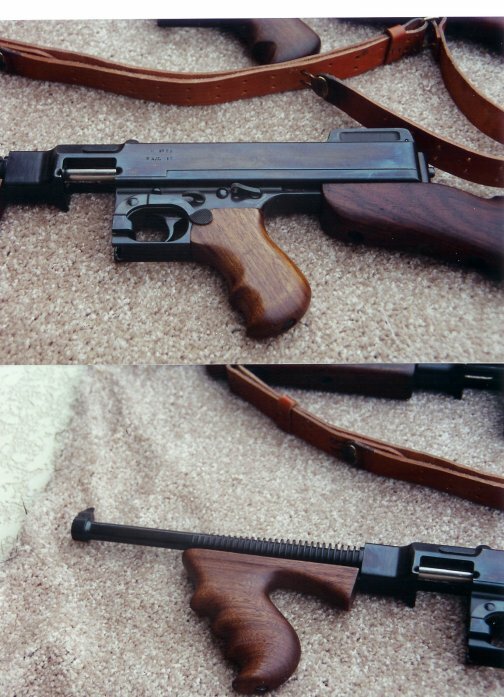 Compare your NAC "Colt's" lettering on the receiver to how it is on your 1921A. Is that thicker "Colt's" on the NAC just the white lettering? Seems the white application can only highlight the depth and width of the roll mark. Did you get a chance to take a squint at the machinist markings inside the receiver below where the Cutts is located? I did not look inside. I can do that after I have them. I don't have time to look at the Colts being thicker right now -- working to pay back these guns. I don't think it is different. Look at all the commas, etc. They are the same. You need to click on a photo to see it at the higher resolution. You can see the splotches for yourself. They look like someone cold-blued over rust. In person they have a different sheen to them, as you can see in the angled shots with the lighting coming from the side. But they don't really seem that rough. But yes, they are very much there. And here is a picture of NAC 15. Not as large of a jpeg though. They is really nice looking. Should have blocked out your serial number before posting (just kidding -- I always wonder why people do that). Funny how threads regarding repro items get so many hits.